Have you ever wondered if you are a Sensitive Lion or a Helpful Koala? Then the Charanavi is the reference book for you. This cute little book is filled with personality types defined by 12 animals, and each animal is broken down into 4 to 6 categories based mostly on birthday. You find out which animal you are by filling out a simple formula based on two number tables in the first few pages. Following the formula, I am a Sensitive Lion. The personality descriptions match those of generic horoscopes, broad to encompass everyone who reads it, but focused enough to be somewhat true for the individuals it actually belongs to. Along with the personality summary, there is a chart for which of the animals I am best suited with, a chart depicting my levels of fortune and luck over the next few years and other famous Sensitive Lions. There is even a romance compatibility chart in the back of the book. My boyfriend (the Restless Monkey) and I are 95% compatible. Whew. I think this book would make a great ice-breaker at parties, family get togethers, it might even be a fun way to start off the first day of class to get the students to know a little about each other. I don’t particularly believe in horoscopes and numerology, but I did have fun looking up my birthday, my boyfriend’s (The Restless Monkey) and my sister’s (The Powerful Tiger) just to see what it says for them and to see if we are compatible or not. 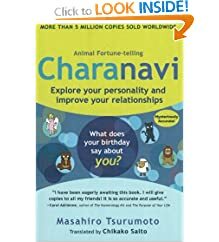 This entry was posted in Books, Nonfiction and tagged Animal Fortune Telling, Book review, Charanavi. Bookmark the permalink.